We may finally have some deadlines. We may have a framework from which important questions can be answered. We may finally find out if Howard Terminal makes sense once and for all. A group calling itself Oakland Waterfront Ballpark L.L.C. sent a letter to the Port of Oakland last week, asking for an exclusive negotiating agreement (ENA) for Howard Terminal. The ENA would run up to 12 months, allowing OWB to negotiate a long-term ground lease for Howard Terminal. A second period would be used to obtain permits from the City, Bay Conservation Development Commission (BCDC), and State Lands Commission (SLC) as needed. That time would also be used for the environmental studies (EIR, others) that would be required to secure such permits. After that’s done, the actual ground lease would be exercised, potentially leading to the construction of a ballpark on the site – pending club and league approvals and buy-in. OWB is made up of mostly familiar faces: Clorox CEO Don Knauss, former Dreyer’s CEO T. Gary Rogers, Signature Properties principal Mike Ghielmetti, Baseball Oakland leader Doug Boxer, and a new entrant, developer Seth Hamalian. Hamalian’s planning a high-rise residential building in Uptown. Howard Terminal’s still in a state of evaluation by the Port, as the Port is considering three other bidders for short-term use as longtime operator SSA departs for Middle Harbor. A group assembled by the Port to study future uses will not complete its work until the end of this quarter at the very least, and the Port is bound by the SLC to ensure that the land is used for maritime purposes as long as possible. A ruling in favor of OWB would help pave the way for a non-maritime use such as a ballpark. It’s possible that maritime uses could be arranged as a temporary use while the details of the ballpark plan are worked out. A key item in the letter is the notion that OWB could come in at any time do testing of soil or groundwater at the site. While that’s good, that’s really only a continuation of monitoring that’s already in place by law. The big issue is what happens to the site as it’s modified to accommodate a ballpark (and ancillary development). That includes potential cleanup or contamination that may occur with a breach of the asphalt cap at Howard Terminal. OWB would be obligated to deposit $50,000 with the Port for the original six-month ENA, with another $50,000 due if a six-month extension is required. If they two sides can’t come to an agreement on the ground lease, the deposit is refundable. OWB would have the right to assign the ENA to current or future A’s ownership if they came around to liking the site. Oakland Mayor Jean Quan, for her part, keeps pushing an idea that zoning should be easy at Howard Terminal because the site was considered for a convention center long ago. It’s a strange claim, we’ll see how well it holds up. At least OWB acknowledges the roles of the BCDC and SLC. Those two bodies are going to impact the scope and final approval on the project, there’s no way getting around it. Among the matters to resolve: Where is the shoreline technically and how close to the shoreline can they build? One thing missing from the KTVU and EBX links above is the ever-persistent question of cost. Cost sank Victory Court before ($240 million), and it threatens to sink Howard Terminal. 2001’s HOK study had Howard Terminal’s site cost at $177 million, and that was without any new transit infrastructure such as a nearby infill BART station or a streetcar to bring fans from existing BART stations downtown. A 2004 Caltrans feasibility study commissioned to investigate such options estimated that a new BART station along the West Oakland alignment between Market and Filbert Streets would cost $250-300 million, and that other options at Brush/Castro or Washington Streets were not doable due to the incline of the track, more than the 1% grade required for BART platforms. Neither OWB nor Oakland has to start a feasibility study or an EIR until the ground lease with the Port is worked out, which is a shame because we’ve been wanting to know the cost for many years. There’s absolutely no reason why such work couldn’t start today, as long as one party budgeted money for it. It’s a chance to delay the reveal until circumstances force a decision, which is the way the mayor’s painting the situation. Quan mentioned on KTVU that the Raiders’ stadium deal at the Coliseum could be done by the summer. That assumes that everything goes well, including the all important determination of how to bridge Coliseum City’s funding gap. The adult conversation comes with many steps. This is a big step. A fully refundable, $100K deposit for a one year option on the property is not a characteristic of a credible offer, especially from a group that includes high wealth individuals like Rogers and Knauss. Ed. – The comments engine has been tripping all over itself the past couple of days. It should be good now. If MLB and Wolff already have declared Howard Terminal a non-starter, what’s the point? Is Oakland going to pay the massive costs of cleanup? Will we need 5 to 7 years of study to re-conclude what Wolff already said: that Howard Terminal is not doable? Howard Terminal appears to be a maximum expense-for-minimum return site, just for the sake of keeping the team within Oakland city limits. Will Oakland suggest permanent revenue-sharing to make the site work, in opposition to MLB’s goal of getting the A’s off revenue-sharing? Just let them be with their “news,” will yah! Yeah, the obvious would be “Wolff has already said no to the site”, but that could change, if MLB does not give in on San Jose, and the lawsuit does not work out. I don’t think this group would be putting this much work in, if it did not have an outside chance of working, and as crazy as it sounds, perhaps MLB will be willing to continue to have the A’s be a possible revenue receiver, after all they are confining them to two counties out of nine. This may not work at all, but it is a refreshing step, not to overstate this, it’s just one step in a marathon but attest it’s a step, and any step Oakland can make is a big step. Why so hard on any Oakland news? just does not seem like you. It lest there are efforts being made at CC, and HT, while it’s true , these efforts could be characterized as a long shot, it was not too long ago we, where criticizing Oakland for doing nothing at all. This is all a stalling tactic. The OWB has to only put up a fully refundable maximum of $100,000. This is pocket change for them. In return, Oakland’s elected officials can let this charade continue right through to the upcoming elections. My apologies if it appears that I’m coming off “hard” on Oakland. Beating a dead horse, it’s just that these boosters continue to ignore the huge elephants in the room (no pun intended) such as Wolff/MLB declaring HT cost prohibitive (how does this stuff get paid for?! ), all while instilling false hope for those who would want the A’s to remain in Oakland proper. Raiders stadium to?! Where the hell are they going to get all that funding?! The rhetoric of Oakland boosters championing the Giants territorial rights to my hometown doesn’t help things either. Just free us (officially), and may the best town win!.. sorry for earlier ML, just lost a big comment i made yesterday because ogt “access denied” last few days. Anyways its good to see some action to get a definitive answer as to access and cost of doing HT. LGO folks should prove the viability of their option. Lakeshore- I think people are just burned out with Oakland news. I mean from coloseum city, to VC, to HT. It’s really hard to keep up. That’s why, at least for me, any “news” out of Oakland seems more like PR. And this might just be solid news, but some of us are very meh about it given oakland’s history the past couple yrs. I’m just waiting for the season to start. And we know if the Raiders manage to extract some $$ out of Oakland, MLB will want it matched and then some for the A’s. Oakland’s spending on facilities for its teams since 1995: Raiders – $120 million; Warriors – $121 million; A’s – $0.00. Yet the A’s get to look like the bad guys. Shouldn’t the A’s get even more than what the Raiders get out of Oakland to even things up? Of course, I’m not convinced the Raiders are getting any taxpayer money out of Oakland at all. All fare questions, I don’t see how any reasonable person, could not conclude, that if the San Francisco Giants, where not holding San Jose hostage, it would be the best place in the Bay Area for the A’s. I hear what you’re saying, and for the most part fill the same way myself. If the A’s are not permitted San Jose, or cant gain it by the lawsuit, let’s just hope this is the first reasonable step Oakland may have taken, considering the alternative, would be out of the market altogether, now wouldn’t the SF Giants be happy about that. Anybody want to guess what I would say here? I don’t think they have to guess. Me and pjk at the new 98% private funded Howard Terminal field for the 2017 A’s… and 8 miles down the road…the new Oakland Raiders stadium…San Jose will have the great Sharks and the Santa Clara/S.F 49ers. ..
That was funny, my man. I’ll just leave that right here, as it pretty much sums up what this about. I wish them luck, because Howard Terminal is probably the better option when compared with Coliseum City (absent any true, recent cost estimates). If it were to happen, and that’s a big if, it would probably be more like 2018 at the earliest, a more reasonable time frame would be between 2018-2020, with all the work they would have to do, don’t get to excited we don’t even know if it can be built on yet. The strategy for HT is to pretend that the site problems don’t exist – treat them as no big deal. Just put out a fancy sketch of a ballpark with the lights shining on the bay. I already watched the Earthquakes stadium construction get pushed back a year because of unforeseen problems with the site. What kind of delays might we anticipate at HT, where we already know it has big-time contamination and railroad obstruction problems and nobody is stepping forward to pay for any of it? Selection of HT might just mean the A’s are stuck at the Coliseum forever or until some other city ponies up a ballpark. I love you for that editorial, my man. The truth is it may take till 2020-2022, even if it was built in San Jose, with The SF Giants fighting as much as they are, if the SJ lawsuit goes well, who knows how long that will take, actually a ballpark would probably happen quicker, if Wolff took the path of lest resistance and just built at CC, the land is already owned by the city county, an EIR should not be too much of a problem, and no NIMBY groups to concern yourself with. We have waited this long, and if anything gets built in the Bay Area San Jose, Oakland ,Fremont, 580 out by Dublin Pleasanton, it’s going to take a long time. re: no NIMBY groups to concern yourself with. …never say never. If MLB and Wolff decide public funding is needed to make a ballpark work at CC, citizens groups will arise spontaneously to oppose any “giveaways” to the team. And count on some county and local politicians to join in with these funding opponents, too. While MLB views public funding as investment in the community, many locals simply view funding of stadiums as welfare for billionaires. Oakland’s not-so-good financial situation makes it problematic to propose public funds for stadiums. And so far, no city or county officials have – at least not in public. Somewhat tangentially relevant to Coliseum City… but apparently the Raiders can’t even pay their cheerleaders their full salaries. And these guys are going to help build a $1.5 billion dollar football stadium? This seems to be a common talking point in some circles. It’s highly problematic because it’s not true. The closer Coliseum City gets to reality, then the reality of the debt situation sets in. Keeping the A’s in the Bay Area much less in Oakland isn’t as high a priority as us A’s fans would like to think it is. The NIMBY situation is the most under reported part of this story. It’s very real and a very big issue. I hope we get the chance to tackle it. Wow. That says it all. I saw a report the other day on the 10 richest NFL team owners. Paul Allen (Seattle) topped the list, the Dolphins Steve Ross was on it. No 49ers owners on the list. Anybody want to guess where Mark Davis would rank on full list if one were published? 32nd (last), perhaps? re: The NIMBY situation is the most under reported part of this story. 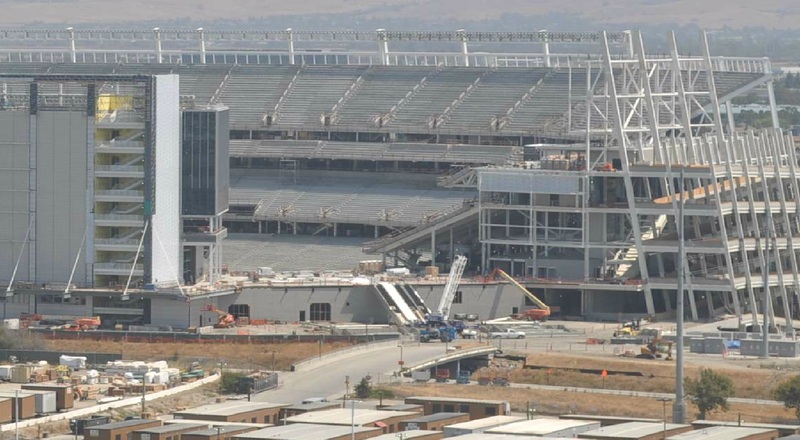 …There would be a NIMBY situation in San Jose, too, if a stadium actually started to proceed. Not the phony astroturf “Stand for San Jose” group or the other group that simply opposes everything and apparently descended from arena opponents. I’m talking neighbors who would oppose the project, hire lawyers, etc…Apparently, a lawsuit against funding for the Vikings stadium was just dismissed so they are having their troubles there, too. About this Raider cheerleader lawsuit, it’s an issue, but it seems that its an issue with more than just the Raiders cheerleaders. I hope we can resolve thus situation in house with the lovely raidereets. ..dont want this to linger… in fact of we do get a new stadium we should throw in a gym or a room for the raider ladies to practice and have meetings in. All these possible studies don’t mean squat unless the A’s are onboard. If LW has already said no to a potential old sight at being unviable I don’t think a new study is going to change the A’s ownership mind. I still feel its SJ or GTFO of the Bay Area. I don’t believe you’re the one who decides how an A’s ballpark gets financed here in the Bay. That realm belongs to Mr. Wolff and MLB. They’re the experts, not you or I. There are always NIMBYs and they detailed a railyards arena plan in Sscramento when Heather Fargo was Mayor. There are NIMBYs, the same NIMBYs that delayed Brookkyn Basin for a looong time, that will fight Hiward Terminal. There are more “anti sports” folks in Oakland than pro sports. That’s true in most big cities. Hay guys, when I mentioned the possibility of Wolff, perhaps taking the path of least resistance and building at CC, I was only referring to the NIMBY groups directly associated with the surrounding area that the team would build on. The coliseum already has two sporting venues on it, so it stands to reason that if the A’s Raiders or Warriors for that matter wanted to build there, it should not be much of a problem from the stand point of surrounding area. I agree with you (pjk) the NIMBY groups that spring up just from the I don’t want my tax money spent on this project will be a tuff fight, and that by it, may be what drives the A’s from the Bay Area, because I don’t see tax money coming from any city in the Bay Area. Jeffery I also agree with you it’s going to be difficult to get anything done, weather San Jose, although they seem to be working with area groups near Dirdon, but your right, look at what the Warriors are going through at piers 30/32, and even if they fall back and would like to use HT themselves, you could get a lot of pushback from JLS area home associations, and west end of Alameda folks, over any project that would be at HT. well I love my sports teams and they are ways for our bay area cities to take care of city and afford sports. If we are afraid of nimbys groups then let the A’s and Raiders and maybe Warriors leave the bay area. Lets not let these groups ruin things for everyone…if we dont stand up for something then neither San Jose or Oakland deserves it at all. re: may be what drives the A’s from the Bay Area, because I don’t see tax money coming from any city in the Bay Area. …I agree. If the NFL and MLB insist that public money be spent, then both teams are gone. This is not Cobb County, Ga, ready to open up the city vault. This is the Bay Area, which has an aversion to spending any public money on pro sports facilities. Both Oakland and San Jose make lists of cities in dire straits financially, due to pension costs, things like that. San Jose has the private money to get the ballpark done, Oakland does not. But if MLB insists San Jose must pay to play, then San Jose might as well sell off the Diridon property for other uses right now. Could not agree more, with you more pjk, San Jose could get it done, but the million dollar question, will MLB let the A’s to build a privately financed ballpark in San Jose?, if not we may be looking at the Portland A’s, because if MLB will not let it happen in San Jose, they certainly are not going to let it happen in Oakland. I am with you harry, but there is a lot against us, weather its San Jose or Oakland. I hope we can get something done in the Bay Area, but the more I think about it, perhaps the San Francisco Giants blocking the A’s from San Jose, was not the worst thing they did concerning the A’s, perhaps the worst thing they did was to privately finance their own park, people in the Bay Area just don’t see why tax money should go toward sports stadiums. Rules are rules…sports represents your city and it always creates city jobs for the local ppl temporary or not. I know a lot off ppl who need these jobs and are worried day n night if the team leaves. So its up to us, me, you even Marine Layer to stand up to these Nimby groups.I dont know the exact number of how much tax payer money would Oakland or San Jose need to fund the ballpark. But we can figure something out. What private money? What is your definition of private money? Inquiring minds want to know! The more i think about this, the more it’s just so messed up and I am glad I don’t have to try and find a solution. If I am Oakland (an official, not the entire city), I’d most likely try to dump the coliseum city thing as soon as it was convenient. There are some real long term issues that are likely to arise if that “plan” is ever “successful.” What I mean is, there is no way that massive vision happens without the city taking on more debt. Building a huge retail/office district in that area is likely to be a huge let down, but if it isn’t, it most likely siphons the growth away from Uptown/Downtown… Basically, fragmenting the potential for growth in a city that isn’t large enough to support two central business districts. Howard Terminal is adjacent to downtown and has the potential to accelerate the benefit of development within the city. Ivan, I don’t know why you ask a question you aren’t willing to accept an answer too. But have fun telling everyone the sky is green as they respond. Ivan: There have already been dozens of South Bay corporations lined up expressing interest in supporting a new ballpark in San Jose. Naming rights were sold to Cisco years ago. In Oakland, we’ve already seen firsthand the weak corporate support given to the A’s and Raiders. Mark Davis recently presented a map of where the major corporations are located in the Bay Area: Lots and lots in the South Bay, maybe one in Oakland. Does it make sense to try to privately fund a ballpark in San Jose or Oakland under these circumstances? And forget about owners charitably building an Oakland ballpark without regard to return on investment. Also, forget about selling sponsorships and suites at an Oakland ballpark to South Bay companies when the ballpark would be 40 miles away and accessible only via bumper-to-bumper rush hour traffic. Ivan your barking up the wrong tree, my family has been living in Oakland since the 1850’s, I would like to see the A’s build in Oakland, just as much as most Pro-Oakland supporters, but being Pro-Oakland does not mean Oakland only, I would be more than happy to support the San Jose A’s, (not to be disrespectful), but you’re totally ignoring the facts, Lew Wolff has said repeatedly he would privately fund a ballpark in San Jose, There was also the letter sent by the San Jose SV interest to the commissioner, where they said they would commit privet funds to the A’s effort in San Jose, that does not mean it can’t work in Oakland, but the fact is Silicon Valley is the driver of the Bay Area economy. People in San Francisco/East Bay, may not like it but the South Bay has more economic power then SF/ Oakland East Bay put together. Things have changed in the South Bay, it’s no longer agriculturally based, I am sure some of the SF elitist, wish it was. re: Things have changed in the South Bay, it’s no longer agriculturally based, I am sure some of the SF elitist, wish it was. …which is why East Bay and Frisco columnists are pleased with MLB’s vintage 1940s view of the South Bay as nothing more than a minor league outpost of Frisco. MLB would rather lose Big $$$ in Oakland than make Big $$$ in San Jose, apparently. @pjk you really didn’t answer my question. @lakeshore you didn’t either but that’s alright. Go back, look at my question. If you are saying a privately financed ballpark means corporate money . . . Safeway, Kaiser and Clorox said they would buy the naming rights, luxury boxes, etc. years ago. @Ivan, you’re right there’s private capital available in Oakland too. The issue is the depth and range of sources of private capital that are available in San Jose relative to Oakland. It goes more to the risk of acquiring that private capital. You can argue that Oakland can just as easily tap into as many resources, but since more of that wealth is either based on Silicon Valley (or leveraged in San Francisco), it comes at a higher “risk”. Basically, there’s a better chance that when faced with investing in Oakland they say, “Nah, not interested”. You can disagree with that if you want. Overall, like I said though, I agree with you that there’s private wealth that would be available to an Oakland stadium (and/or financing plan). It’s just the level of risk associated with acquiring that wealth and investment. Quan wants mlb/LW to make a decision on HT/CC. Not gonna happen given the 2015 timeframe proposed for 9th district to render a decision on SJ lawsuit. There is plenty of time for this group to start an EIR and get answers to many of our questions–just like SJ did with Diridon. Of course there will be no guarantee that the site would be selected by LW even if it did prove feasible pending the outcome of the lawsuit. It will be interesting…if it is true that they are close to a deal with the Raiders (I have my doubts) and the Coli needs to come down in 2015 then the A’s will be homeless and the SJ lawsuit will still be slogging its way thru the courts. Of course if money was not a factor and LW said yes to HT today there is no way this park would be ready before 2018—still leaving the A’s homeless. Ok, like I said it can be done in Oakland?, what’s your point, you come up with what I think is a silly question (not trying to be funny) , that been answered a hundred times over, when it comes to San Jose, and then you come back with this Safeway, Kaiser, Clorox stuff, ok so what? Man if you want to have an intelligent conversation about the real challenges, and possibilities of an A’s park in Oakland or San Jose, I am all in but this Oakland vs. San Jose crap is not productive. I wish S.O.S would concentrate on the Raiders and let the A’s and Warriors find their own new homes and as frank Blackwell said “welcome them back with open arms”…whether Raiders dont get a new stadium or do.. they need to control the Coliseum for themselves and take away some of the mount davis debt from city of Oakland. I agree with lake shore that the Coliseum land would be the quickest and less hurdles area for the Oakland A’s in the entire bay area. So there is some truth Lew Wolff might build at the coliseum if he sees san jose ad too many hurdles. 12 companies attended the original Don Knauss press conference. 75 signed the Silicon Valley Leadership Group letter. If you want to go through the SG&A budgets of each of those companies (those that are public) and compare who has what kind of coin to apply to buying luxury boxes, be my guest. I already did long ago. We already have a long history of those East Bay companies not supporting the A’s and Raiders now. The Raiders are at the bottom of NFL revenues and the A’s require league revenue-sharing (welfare) to survive. Meanwhile, the 49ers are selling out after moving to Silicon Valley. ‘Nuff said. There’s no comparison between the East Bay’s economic strength and Silicon Valley’s. You have officially hurt my feelings. I’m bummed. I sent you an olive branch last year with reference to buying you a belgian ale, and this is the response I get. If these kind of attacks continue . . I will have to stop joining the discussions on this board, and I know you, and others, do not want that! So please, stop attacking me for asking simple questions. @all – In two weeks there will be an SOS-sponsored East Bay Business Summit, to help raise interest in keeping the teams in town. No way does the South Bay need such events. They’d be competing with each other to get the best seats, suites, and sponsorships. The obsolete MLB ATE will likely soon be coming to an end or it will lose much of its bite. Historically, it has been on shaky legal ground since it was legislated. It was passed in 1922 – way before cable tv, the internet and MLB licensed merchandise. To argue that it is not a monopoly now because it is still considered an intrastate business and not anti-competitive is silly. The MLBTV site, for example, hosts 4,000,000 subscribers and annual revenues of $600 mil. The Yankees YES network’s annual revenue is $300 mil. (both businesses rely on plenty of interstate revenue) The MLB ATE is becoming more and more obsolete because of cable tv and the internet’s rising prominence. The higher courts are likely aware of the inconsistances and anti-competitiveness of the MLB ATE and that it is obsolete. Selig and MLB are also likely aware of the MLB ATE’s vulnerability and will likely cut a deal with San Jose/the A’s to avoid the higher courts overturning it, if Selig doesn’t – the courts will likely overturn it – that’s why the A’s likely know the way to SJ.